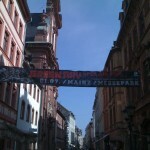 Jan picked me up in the early afternoon, & we made our way into the city center of Mainz. After parking & walking for a bit, we decided that it would be a good time for lunch: pizza. There was a place that Jan especially likes, run by an Italian family, that we made our way to – after reading through the menu, I decided I’d get the pizza called, “Der Teufel” (the devil,) which came with pepperoni, red (hot chili) peppers, & pepperoncini. Amazing. We spent the better part of the afternoon catching up on the happenings in the churches that Jan oversees – especially those that we’d be spending time with over the next days. It was an absolutely beautiful day, with a temperature of about 75, with the slightest of breezes. I enjoyed it even more when I heard that it was snowing & hailing at home. Goodness. It’s April… practically May. 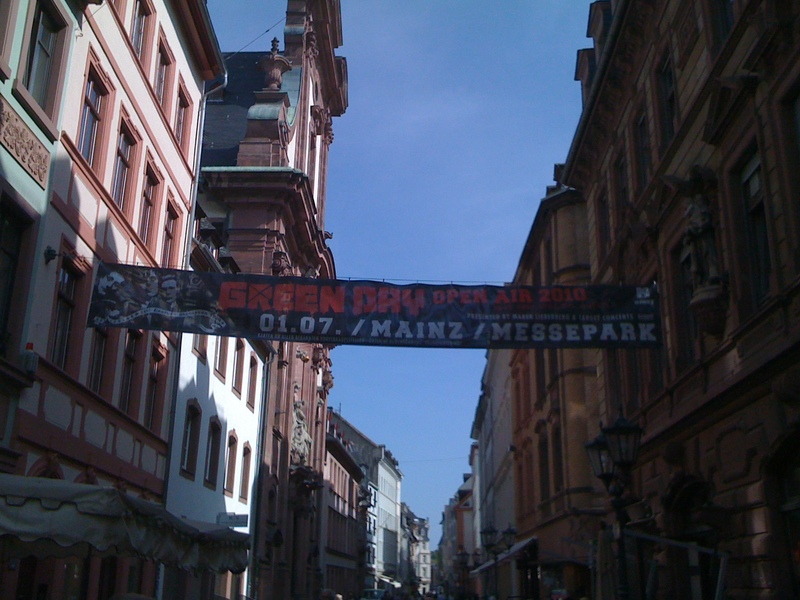 This picture is a banner I saw while walking through the narrow streets of Old Mainz. Green Day is coming to Mainz. It is a small world. No visit to an authentic Italian restaurant is complete without gelato . I chose chocolate & vanilla, covered with chocolate sauce & Schlagsahne (whipped cream,) for brother Ben. The time came to make our way to Taunusstein, a small town about 30 minutes by car from Mainz. Whenever I ask people to tell me about Taunusstein, they always say, “It’s in the forest.” I can see why. Getting there is like driving Highway 28 from Spooner Summit to North Shore Lake Tahoe; beautiful scenery, fresh mountain air, & trees as far as the eye can see, with the occasional break in the woods that allows glimpses into the valley below. Very nice. About 3 years ago, Jan & the enChristo church decided to partner with some of the people that had been traveling the 30 minutes to their church to see a bible study started, & hopefully, eventually, a church planted. We met first with the appointed leader of the church plant, Curt Staab. He graciously welcomed us into his home & ushered us onto the back patio that his family shares with the other tenants of the ranch style/condo-type housing block. 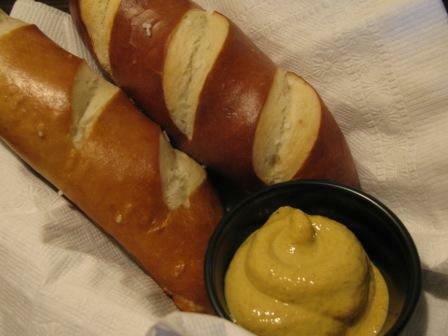 He’d prepared dinner himself, an authentic Bavarian feast: white sausage, kraut-salad, & fresh baked pretzel bread. Curt & his wife Claudia have been a part of the church plant team since the beginning, & have served as assistants, then leaders of the plant which is still sponsored by & overseen by enChristo & the Foursquare Germany leadership. Curt is a practicing medical doctor in his “day job” & is a humble, dedicated, & faithful man giving his all to see people come to know Jesus & grow in him. Over dinner, I received my assignment for the night: I’d be addressing a home cell group of about 12-20 people, using the book of Acts as my template, talking through the beginnings of the church, tying it in to what the people in Taunnustein are doing, & also referencing some of my own experiences from church life. Sweet. I scratched a few notes on a pad, & we drove to the home where the group would be meeting; imagine my surprise, a couple from the Frankfurt area that I’ve known for several years, Speedy & Fema Rakus, happened to be there with their 2 sons. Speedy is in his residency, & recently relocated to Taunusstein… & in turn, joined the church plant. I thanked God for the friendly (& familiar) faces. We began with a DVD message from my supervisor, Ron (the DVD I showed in church last week.) I was so thankful to have an ice-breaker – an introduction & personal blessing specifically recorded for these meetings we are in, as well as an explanation of what it means to be Foursquare, addressing at the very heart level fleshing out love, acceptance, & forgiveness. It was very well received, & the room noticeably brightened. Jan was serving as my translator, & I tried to get my brain working on multiple levels – what I was talking about, & also how I was communicating it – aiming to keep it in complete sentences & thoughts for ease of “idea to idea” translation. The main scripture used was Acts 2:42-48 – where in the aftermath of the first church growth ‘explosion’ of 120 – 3000+ people, the apostles, in response to the leading of the Holy Spirit, found a way, a flexible though functional structure to make sure each believer was in a place to receive discipleship. As I talked, I was reminded of the great need we have to be in relationship; for the opportunity to be face to face with others on a regular basis in a group small enough to allow intimate & intentional discipleship to take place. I shot up a quick prayer for Hillside & mentally noted to keep praying for the continued development of ‘life giving small missional communities’ (small groups if you want to use a cliche) in our church family. The time flew by, & illustrations & promptings readily came to mind – we laughed a lot. I’m thankful that some of the things I’ve learned the hard way were able to be used as an example that others might not have to go down the same route I did. At the end of the talk, there was time for questions… the questions came, haltingly at first. On topics like elders. Leadership. Church structure & church government. Distinctions between elders & leaders (Germans are very, very precise & exact in their definitions.) Differences between the US & German Foursquare structure, bylaws, & government. Prayer. We prayed together, said our heartfelt goodbyes, & Jan & I slipped out to make the drive back to my host home. Both of us were tired from the long day (& night) & also from sitting & walking in the warm sun for most of the afternoon. Briefly, we talked about our next days agenda, a visit to a town called Bingen, where we’d be spending time with an independent church that is in year 2 of a 3 year process to be adopted as a member church of Foursquare Germany. Had the good fortune to make it home around midnight, just in time for my schedule & theBean’s to overlap long enough to Skype. Goodness, she has blue eyes. Sigh. Woke to the sound of my alarm, the 1st time I’d not woken up before it. (In honor of Brintus, I used the Darth Vader music from Star Wars. Starts my day with a smile. Yo B! Thinking of ya!) Staggered to the bathroom to shower & then to the kitchen (with all the appropriate steps in between,) to find that my hosts had laid the table with everything necessary to start the day great. Again! A carafe full of steaming coffee. Mueslix (2 kinds.) Yoghurt. 3 kinds of juice. Dark German bread. Brötchen (little bread rolls.) Ahh. I feel so blessed. Wolfram & Heidi – thank you so much for your hospitality. What an incredible perspective – to be thankful for hosting me? Recognizing that they were getting to partner in the declaration of the gospel Good News. It was a very cool moment that makes me all weepy. I love my life, & am grateful for the chance meetings that are sign posts declaring God’s goodness, blessing, & care to me & mine.